Archives : CONSOLIDATION NEAR THE TOP - 25/10/2013. CONSOLIDATION NEAR THE TOP – 25/10/2013. SENSEX RETRACES FROM THE SUPPLY LINE. Market is consolidating near the all time high levels. This week the Sensex has retraced from the long term Supply Trendline (Sensex – 21003 and Nifty – 6318) which is providing strong resistance for the last five years. Breaching this Trendline will not be easy, as strong supply will be encountered every time the market tests this level. Hence a short term consolidation between Nifty 6050 - 6250, will hold the market in good stead. Sensex opened the week at 20915, made a high of 21039, low of 20589 and closed the week at 20683. Thus it registered a weekly loss of 199 points. At the same time the Nifty opened the week at 6202, made a high of 6252, low of 6116 and closed the week at 6144. Thus the Nifty closed the week with a loss of 45 points. Both Sensex and Nifty have formed a small black body Spinning Top on the daily charts. This formation on Friday is the fifth day of consolidation as the last five days have all formed small body neutral candles. Also the weekly charts have formed a black body candle which is not bearish. Had the Nifty closed below the midpoint of previous weeks candle then it could have formed a Bearish Dark Cloud cover, but that is not the case here. Hence both daily as well as weekly charts suggest a consolidation in the near term. Last week both Sensex and Nifty bounced back from the gap between Sensex 20368 – 20323 and Nifty 6046 - 6033. Thus this gap acted as a support as the Sensex bounced from a level of 20375 and Nifty 6032. Thus a breach of this low will signal a trend reversal in the short term timeframe. The current bullish rally started after forming a Bullish Island Reversal and after that the market has gone from strength to strength. Now the market has encountered a strong resistance in the form of a long term Supply line which is falling at Sensex 21003 and Nifty 6318. This week the Sensex tested this level but could not close above that, hence it now consolidating. A close above this Trendline will set the market to not only cross the all time highs but move towards a potential short term target of Sensex 22214 and Nifty 6584. The current rally started from the low of Sensex 19264 and Nifty 5700. This was from the strong Support Zone formed by the confluence of the Bullish Rising Gap between Sensex 19293 – 19444 and Nifty 5688-5738 along with presence of 200dma for the Sensex (19475) and 50dma for the Nifty (5794) near this gap. This is a critical gap and a breach of this gap will end the current uptrend. The above mentioned Gap is also a Measuring Gap (Sensex 19293 – 19444 and Nifty 5688-5738) in the current upward rally (the rally which started from a low of Sensex 17448 and Nifty 5118). Then as per Gap theory, the target for the upward rally works out to be Sensex 21289 and Nifty 6308. This week both Sensex and Nifty have remained above the long term average of 200dma (Sensex – 19475 and Nifty – 5851), medium term average of 50dma (Sensex – 19584 and Nifty – 5794) and the short term average of 20dma (Sensex – 20282 and Nifty – 6016). Thus the trend in the short term, medium term and long term timeframe remains positive. MACD and ROC are both positive and continue with their Buy signals. 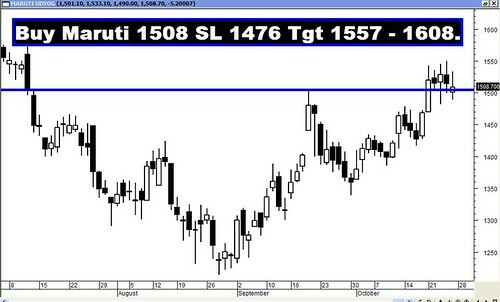 RSI (61) suggests bullish momentum to continue. MFI (65) continues in Buy mode, suggesting money flowing in. Stochastic Oscillator continues with its Sell signal (%K is below %D). ADX is at 19, suggesting that the market is consolidating. The Directional Indicators continue with its Buy signal as +DI remains above -DI. OBV has fallen lower but has not yet gone below the previous bottom. This week again both Sensex and Nifty touched the upper Bollinger band, but could not manage to close above that, hence no signal. Oscillators suggest a bullish bias in the short term. The Nifty O.I. PCR is at 1.45. For the next month series, highest Open interest build up is 6000 Put and 6300 Call. This suggests that the market expects a trading range with support coming in at 6000 levels and resistance around 6300 levels. Friday saw high amount of Put writing at 6100 strike which indicates strong support in the short term. The Trendline Resistance for the Sensex is at 21003. Trendline Support is at 20305. The Trendline Resistance for the Nifty is at 6318. Trendline Support is at 6066. For the week ahead, Sensex will find Support at 20375-20086-19785 and will find Resistance at 20970-21208-21523. For the week ahead, Nifty will find Support at 6046-5957-5877 and will find Resistance at 6229-6338-6443.